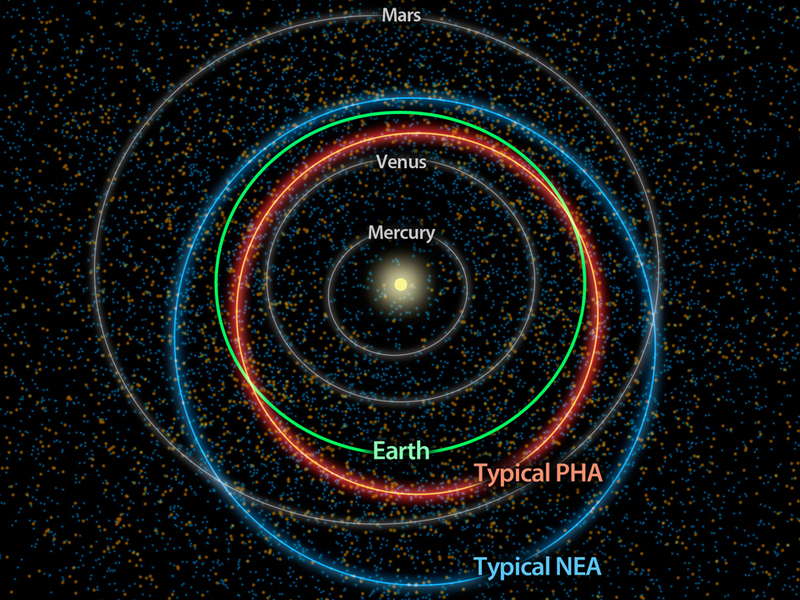 This diagram illustrates the differences between orbits of a typical near-Earth asteroid (blue) and a potentially hazardous asteroid, or PHA (orange) (Credits: NASA/JPL-Caltech). New results from the NEOWISE survey find that more PHAs are closely aligned with the plane of our solar system than previous models suggested (Credits: NASA/JPL-Caltech). The new analysis also suggests that about twice as many PHAs as previously thought are likely to reside in “lower-inclination” orbits, which are more aligned with the plane of Earth’s orbit. In addition, these lower-inclination objects appear to be somewhat brighter and smaller than the other near-Earth asteroids that spend more time far away from Earth. A possible explanation is that many of the PHAs may have originated from a collision between two asteroids in the main belt lying between Mars and Jupiter. A larger body with a low-inclination orbit may have broken up in the main belt, causing some of the fragments to drift into orbits closer to Earth and eventually become PHAs. Asteroids with lower-inclination orbits would be more likely to encounter Earth and would be easier to reach. The results therefore suggest more near-Earth objects might be available for future robotic or human missions. “NASA’s NEOWISE project, which wasn’t originally planned as part of WISE, has turned out to be a huge bonus,” said Amy Mainzer, NEOWISE principal investigator, at NASA’s Jet Propulsion Laboratory in Pasadena, Calif. “Everything we can learn about these objects helps us understand their origins and fate. Our team was surprised to find the overabundance of low-inclination PHAs. Because they will tend to make more close approaches to Earth, these targets can provide the best opportunities for the next generation of human and robotic exploration.” The discovery that many PHAs tend to be bright says something about their composition; they are more likely to be either stony, like granite, or metallic. This type of information is important in assessing the space rocks’ potential hazards to Earth. The composition of the bodies would affect how quickly they might burn up in our atmosphere if an encounter were to take place. The NEOWISE results have been accepted for publication in the Astrophysical Journal. The WISE spacecraft scanned the sky twice in infrared light before entering hibernation mode in early 2011. It catalogued hundreds of millions of objects, including super-luminous galaxies, stellar nurseries and closer-to-home asteroids. The NEOWISE project snapped images of about 600 near-Earth asteroids, about 135 of which were new discoveries. Because the telescope detected the infrared light, or heat, of asteroids, it was able to pick up both light and dark objects, resulting in a more representative look at the entire population. The infrared data allowed astronomers to make good measurements of the asteroids’ diameters and, when combined with visible light observations, how much sunlight they reflect. JPL manages, and operates the Wide-field Infrared Survey Explorer for NASA’s Science Mission Directorate, Washington. The principal investigator, Edward Wright, is at UCLA. The mission was competitively selected under NASA’s Explorers Program managed by the Goddard Space Flight Center, Greenbelt, Md. The science instrument was built by the Space Dynamics Laboratory, Logan, Utah, and the spacecraft was built by Ball Aerospace & Technologies Corp., Boulder, Colo. Science operations and data processing and archiving take place at the Infrared Processing and Analysis Center at the California Institute of Technology in Pasadena. Caltech manages JPL for NASA. More information is online at http://www.nasa.gov/wise and http://jpl.nasa.gov/wise .